Kaeli Stanfield, aka STARFIELD, is a visual artist who works primarily with blacklight reactive paintings and installations. Living on Canada's west coast, in the city of Vancouver, she has established a reputation for a bright and explosive style of art. In 2005 she discovered psychedelic trance music. After witnessing the synergy between this music and the artwork used to decorate trance-music events, Starfield was inspired to create her own glowing banners. Later that year she began a collaboration with Organix, a weekly trance party held at Club 23 West in Vancouver's Gastown. 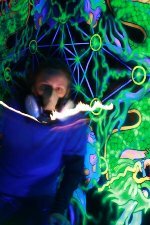 This involved creating custom paintings to decorate the DJ booth, as well as several huge backdrops displayed throughout the club. The ongoing project has since expanded to cover almost every wall. Starfield has done installations for small intimate gatherings as well as large outdoor music festivals. With a focus on symmetry, she arranges her pieces to create the atmosphere of a futuristic glowing dream. In this space there is imagery from a myriad of sources across the globe - her influences come from ancient religious and spiritual symbols as well as pop culture imagery. The lighting is as important as the art, and Starfield employs a keen sensitivity when creating her displays to make the best use of both. Currently Starfield is participating in several outdoor music festivals, such as KARMA festival in Squamish, BC. At this gathering, Starfield is looking forward to working alongside SPACETRIBE and SOLAR from Deliria to create a dance floor to remember! Also expect to see a continuation of her Underwater Space banner series, the next installation will feature a space seahorse!